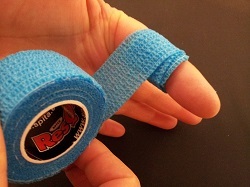 ResQ-plast is the most useful plaster for professionals! during swimming or when you take a shower. It can be applied on dirty, wet and oily fingers. Exellent in jobs where hands get often wet: chefs, butchers, fireman, etc. ResQ-plast sticks only onto itself and remains flexible all time, which allows the normal use of fingers without any problem. securely around your finger. 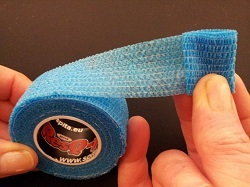 4.Tear the tape and press the loose end of the tape firmly onto itself.